"How can anyone think to harm even just one hair on such a beautiful animal?" 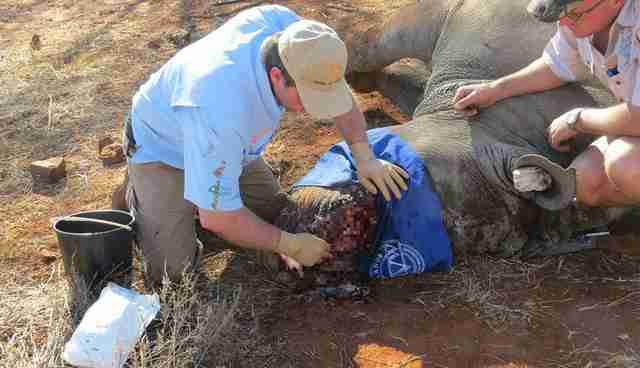 This rhino nearly paid the ultimate price - all because of his horns. Five rhinos were poached on a game farm in South Africa on Saturday, and only one survived the incredibly cruel ordeal - barely. If it weren't for the police officer on scene investigating the incident, who quickly called for help, he would have died. 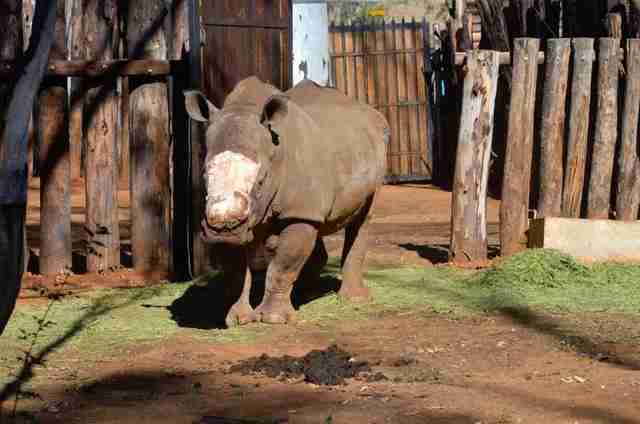 The 8-year-old white rhino had been shot with a tranquilizer, leaving him unable to move while his horns were hacked off extremely low, according to Saving The Survivors (STS). 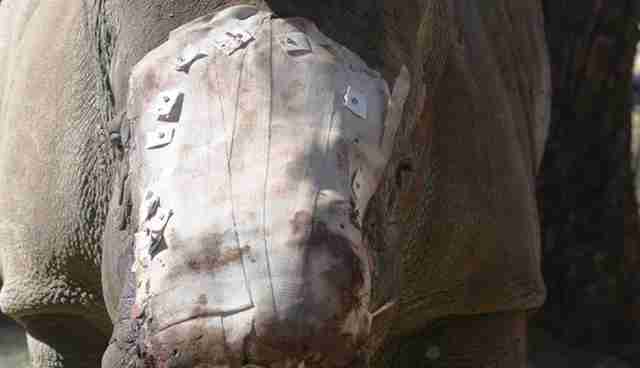 The poachers took half his face along with the horn, leaving a gaping wound that extended to his nasal cavities. 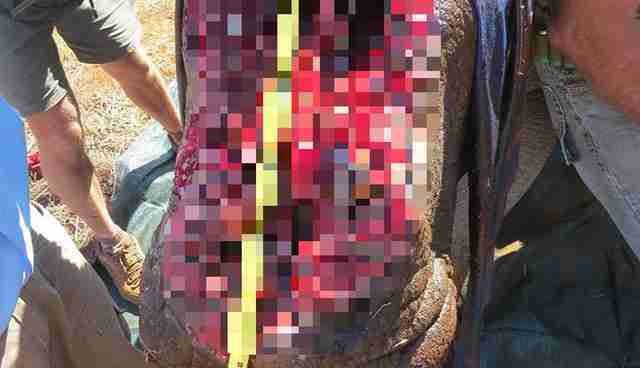 The owner of the game farm wanted to put the rhino down due to his extensive injuries, but STS offered to treat him instead, News 24 reported. 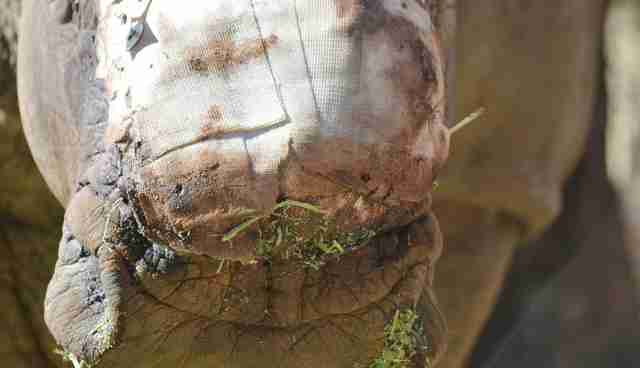 Dr. Gerhard Steenkamp, director of STS, told the news outlet that the rhino's injuries were the worst he had seen. "This bull has survived up until now and the very least we can do is give him a chance," STS wrote on Facebook, in response to criticism about the decision to keep him alive. "Please understand that there are usually four or more veterinarians consulting on these cases and please trust that we are doing this for the right reasons." White rhinos are under serious threat from poachers, as their horn is prized in Asian traditional medicine - meaning every individual counts. But the STS rescuers have had at least one success story to guide them. Hope, a female rhino, arrived at STS last year in a similarly heartbreaking state, but has made an incredible recovery since then. This male poaching victim was named Sehawukele - Seha for short - which means "have mercy on us" in Zulu. And though he has a long road ahead, he's already made a beautiful comeback from his horrific trauma within the short span of 24 hours. 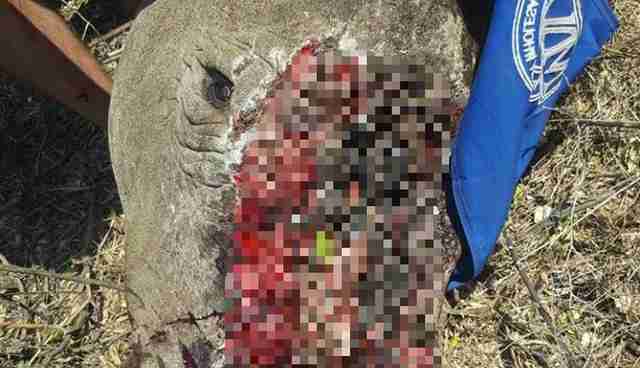 Initial photos of him showed him lying on the ground with more than half of his face missing. He appeared hopeless. But after STS treated him and patched up his wound, Seha was back on his feet, walking around and immediately eating the food he was fed - all promising signs for a robust recovery. "What a handsome boy he is," STS wrote. "How can anyone think to harm even just one hair on such a beautiful animal, not even to mention hacking off two precious horns?" Although Seha and Hope are currently being housed in different areas, STS didn't entirely dismiss the opportunity of the two survivors meeting sometime in the future. For now, the top priority is making Seha, who arrived at STS broken, whole once more. "[He] is doing remarkably well considering what he went through," STS wrote. Seha has a long recovery ahead of him. If you'd like to help save his life, and those of other poaching victims like him, you can make a donation to STS here.